Is HostGator a good web host? Find complete HostGator review here! 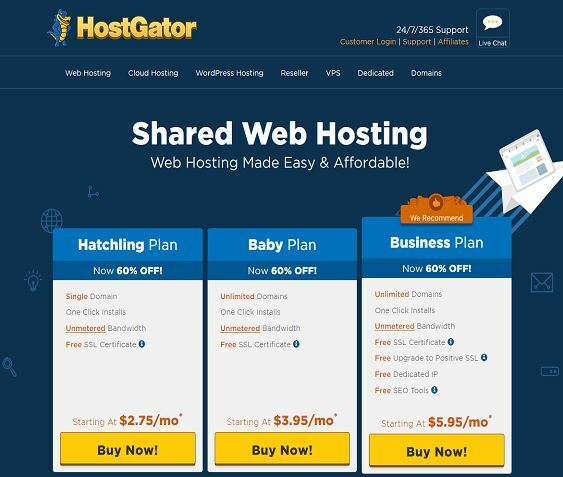 HostGator was founded in 2002 and has grown into a world leading and industry recognized hosting provider with more than 400,000 customers, 750 employees and 12,000 servers under management. The over 8 million domains hosted by HostGator make up approximately 1% of the world's Internet traffic. Today, HostGator serves customers ranging from individual freelancers to Fortune 500 companies in more than 200 countries. Currently we have a website, ToddlerHub, hosted on HostGator. Which hosting plan should you choose? If you just started to create your first website, you can choose the cheaper Hatchling plan. If you need to create more websites in the future, you can always upgrade from Hatchling to Baby plan at the pro-rated basis. Free SiteBuilder - HostGator offers a website design tool with 4500 free templates and 52 free scripts that allow you to create a professional looking website within minutes without any technical knowledge. cPanel control Panel - HostGator uses the web hosting industry standard control panel, cPanel. cPanel allows you to setup your website easily such as create e-mail addresses, sub-domains, MySQL databases and more. In addition, it helps you to monitor the amount of bandwidth and space used. The cPanel also comes with Fantastico, which is an auto-installer for open-source scripts with just a click such as WordPess, Magento, Drupal, Joomla...and more. Free SEO tools - HostGator partners with Attracta to offer essential SEO tools that help to bring more search traffic to your website. The SEO tools include website inclusion in Google, Yahoo and Bing, Google blacklist check, link building, social networking plus in depth SEO tips and videos. Free Website Transfer - If you decide to choose HostGator as your new hosting provider, they can transfer your old website to HostGator for free. HostGator can transfer your web pages, databases, scripts and even your domain name (if you choose so) for free. In additional, they can also do a full cPanel transfer for you that include all domains, Addon domains, subdomains, email accounts and cPanel setting. HostGator the company has more than 750 employees. In a customer satisfaction survey, approximately 90% of HostGator customers reported being satisfied with HostGator and the services it provides. Industry-leading customer service and support is at the forefront of what HostGator does on a day-to-day basis. The company is constantly working to improve and refine that service and support and achieve its goal of becoming the world leader in the global web hosting market. HostGator has chosen SoftLayer to be its exclusive data center and network provider. HostGator houses their four data centers in Dallas, Texas with size ranging from 22,000 to more than 78,000 square feet. This world-class data centers contain state of the art security, cutting edge servers, redundant power, cooling system and more. Servers are monitored 24 hours a day, 7 days a week and issues are acted upon before they become serious. This allows HostGator to make good on their 99.9% uptime guarantee. In addition, HostGator has committed itself to providing greener solutions by purchasing credits for 130% of the electricity used to power and cool the company's servers to work towards reversing its environmental impact.
" I've been a HostGator customer for a few years and I am so VERY happy with the service and support. I have contacted HostGator on a number of occasions (both day and night) and I always get quick answers and resolutions to my problems. I just wanted to take a moment to say thank you and that I am happy beyond words. I joined HostGator because you have the best pricing in the industry, but I stayed because your service is second-to-none. HostGator ROCKS!! " " I decided to transfer my site from godaddy to hostgator for website speed issue. When I arrived here I had some problems that I solve very fast with the lovely hostgator support (I love chat support and ticket answer is very quick). The website now is fast and I'm very satisfied. I think I will be an happy HostGator customer for a long time. 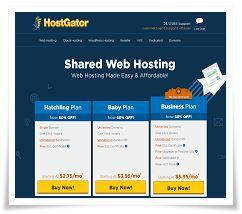 Thank you :-)"
HostGator web hosting plan comes with unlimited disk space and bandwidth with many strong features plus a 45-day money-back guarantee. But HostGator's share hosting plan does not come cheap compare with other web hosting providers recommended by us. It's entry level 'Hatchling' hosting plan which can hosts only one website without a free domain costs $2.75 per month. However, HostGator hosting is well known for it's servers speed and reliability. If you appreciate better reliability and faster website of HostGator web hosting, it may be worth the extra to you.